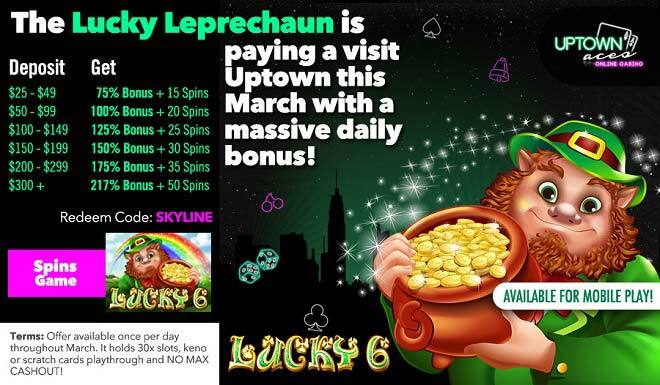 Lucky Leprechaun Daily Bonuses + 50 Free Spins! Spring is here – which means it’s the perfect time of the year to do the happy leprechaun dance! Come up with your perfect moves and let your inner Uptown winner out when you spin the reels of Lucky 6 with a 217% Bonus plus 50 Free Spins! Rainbows, green hills, pots of gold, four-leaf clovers, leprechauns and many winning chances make Lucky 6 your favorite slot this season. Land 4 or more of the Lucky 6 scatter symbols to trigger the Free Spins bonus round where you can win 8, 12 and up to 25 free games! Follow Uptown’s rainbow this Spring where a 217% Bonus plus 50 Free Spins are available once per day throughout the month!